Why not celebrate Halloween in thematic style this year and commemorate the Arab Spring? We’ve put together a list of suggested dictator outfits that could be easily assembled with tips on making the right choice for you. We also provided a handy rating system for glamour and difficulty levels. 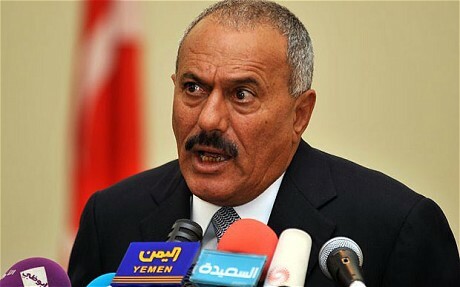 Yemen’s president is one of the least glamorous Arab dictators and is a bad choice. He used to wear dark suits before the explosion that claimed half of his ear and left him badly burnt, but started dressing in more traditional attire since. This phase of his career is more suitable for Halloween but might be a bit in bad taste. 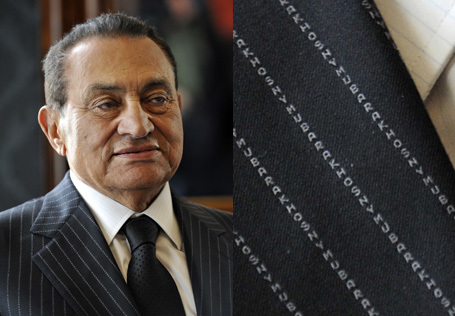 Egypt’s former number one honcho was given to very expensive suits, he hasn’t been seen in a military uniform for decades. The expensively-tailored suits that incorporate his name in the pinstripe are a trademark, but they are naturally hard to come by. You could go for the pajamas-in-a-cell look he adopted of late, but that requires elaborate props. Nevertheless, if you manage to pull it off, you will feel very pleased. But please avoid the nose-picking. Sudan’s reigning ex-military man is not unimaginative when it comes to his dress sense. He frequently alternates between military uniforms and traditional Sudanese clothes. Either would be a good choice, although the latter is probably easier to procure. If you opt for the military style, it’s all about the right hat. Al-Bashir likes them big and flashy, and the same applies to his military decorations. Go for bright colours and don’t be afraid to experiment with unconventional combinations. Iraq’s former strongman has been a long-time party favourite. The ‘classic’ Saddam is the beret and dark-green military uniform, with an over-sized moustache as the main feature. However, Saddam’s other looks, such as ‘the Don Corleone’ and the ‘Soviet dictator’ (a bit self–referential and ironic), are more inventive and original. Cigars and replica guns are essential, and you might want to spend some time in front of the mirror perfecting his trademark chuckle. Libya’s recently departed Big Brother undoubtedly represents the holy grail of Halloween costumes. Not only are his outfits visually rich and varied, they are also easy to replicate. One word: curtains. Preferably from the 70s or the 80s. Failing that, old bed sheets. But that’s not all, alone among Arab dictators Gaddafi understood the importance of accessories. Be bold and go for visual non sequiturs: large pictures, cardboard cut-outs of the African continent and over-sized rings. And spend some time on the hats. I don’t know what you're talking about. In Lohja and Espoo near Helsinki, the Swedes fenced off the school building with barbed wire, in order to ban children the access to a school. Censorship in the mainstream media makes Sweden, Finland and Norway dictatorships, ruled by the political and economic elite. In Finland, Sweden and Norway the political and economic elite controls the media. No one can criticize the elite in the mainstream media. If a state or municipal employee criticizes leading politicians, will he or she lose his or her job. In Finland, Norway and Sweden nobody can have a public post without being a member of a certain political party. In Finland all high-ranking officials, who earn 5000 euros a month or more, are members of political parties.